One of the oldest online poker rooms in the industry, Party Poker started out as an online casino in 1997. After a tough start through its Starluck Casino brand, Party Poker was later re-launched in 2001 and quickly became a favorite site with poker players. 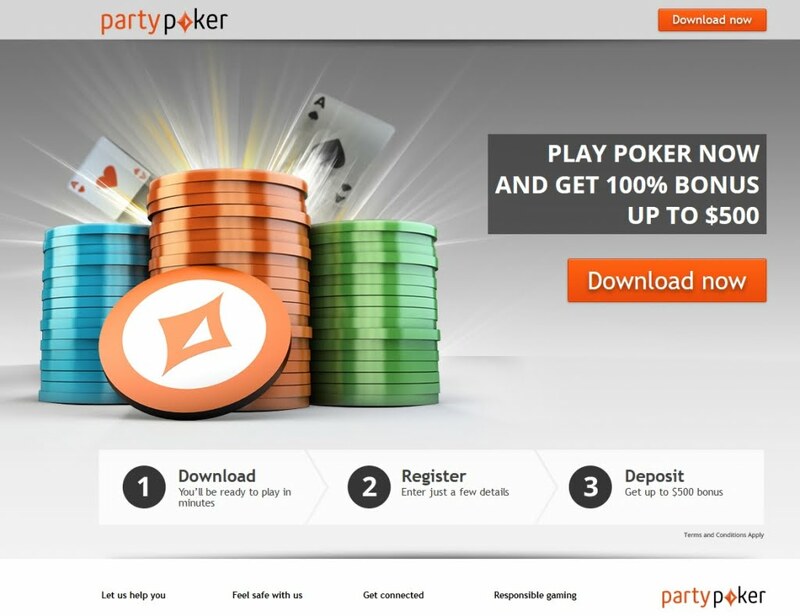 The site’s smooth, simple software coupled with a remarkable marketing campaign pushed Party Poker back to the top in 2003. Fast with exceptional and modern graphics, the software will work slow connections too, with an added capacity to reserve a seat 15 seconds. The software supports IE and Netscape users, and is packed with a raft of special modules like Poker office and Calculatem which are designed so you get more out of your game. The graphics are really old school, boring and they need an overhaul but you’ll get used to them in time. Party Poker’s sister site, Party Casino, utilizes software that hosts a wide array of casino games. You must play real money games and earn Party points to qualify for freerolls at PartyPoker. Party Points can be used to enroll for daily tournaments at $500, $1250 or $2500, and you’ll need about 500 Points for the $500 game. While other sites’payouts can only be redeemed through playing a specific number of raked hands, free-rolls pay real money that’s deposited directly to your account. With an initial cash deposit of just $10.00, youcan get invited to a huge $5000 Freeroll. Party Poker offers a host of single table SNG’s ranging from $5+$1, with several multi-table SNG’s that range from $5+$1. Many of these multi-table SNGs are satellite – style tournaments which get you into the next round of a larger tournament – like the WSOP or the Million Dollar tournament -but for small players, there are no games below $5+$1. PartyPoker is often termed the aquarium since there are so many fish [gaming newbies], a compelling incentive for experienced players. Newbies also have the chance to play with more novice players than other sites, meaning it’sa great place to gain experience. The newbie tag naturally wears off with higher stakes; this site is home to the biggest Limit tournament in the world, PP Millions, after all. Action ring games are the loosest offerings online, for the any limit and particular limit. The largest player base means any game at any limit 24/7 is never a problem. Other games in Part Poker’s line up include Hold’em [No Limit, Limit and Pot Limit] Omaha Hi/Lo [No Limit, Limit and Pot Limit] 7 Stud Hi and Hi/lo [Limit], and Omaha. In some jurisdictions, players won’t have to use e-wallet banking systems like Neteller as they can usecredit cards. Minimum deposit is $10 and deposit methods include eChecks [iGM-Pay], FirePay, Western Union, VISA, Neteller, MasterCard, bank draft, money order, cashier’s check, check and Citadel [US only]. The minimum withdrawal limit is $50. However, only money you’ve deposited can be directlywithdrawn to credit card; withdrawing funds over and above what you deposit is only via check or e-wallets. Other cash out methods are wire transfer, Neteller, eChecks [iGM-Pay]. New players may cash in a free bonus of $10 in addition to the sign up bonus of up to $500. Party Poker also offers T$10 to new players [good for $10 toward any tournament] but you must opt in to receive the offer. Since the free $10 is restricted, you must accumulate 120 pointsto cash it out. Additionally, there may be a delay of up to 48hours in cashing the bonus since the offer is issued manually. No Instant Messenger style support although there’s free call support for UK residents. Email support is good with a sub 24 hour turnaround. Party Poker is great portal for beginners and experienced players alike. It’s also great for players who don’t want to set up intermediary accounts and for those who prefer six handed games and mega-payouts in tournaments. Unfortunately, the site does not accept US players. Party Poker is a popular and highly active online poker site with more than thousands of poker tables and tournaments held all day and night involving real money. Renowned for its massive range of poker games and ongoing poker tournaments, Party Poker is a great place to get started with online poker, whether you are new or have made a name for yourself in land based casinos. Party Poker also offers a bunch of bonuses that will tempt you want to start playing now. Here, we have reviewed the Party Poker site to help you decide whether it’s the online poker site that you should play on. Party Poker is widely acknowledged as one of the leading poker sites when it comes to bonuses, promotional offers, and incentives to join and become a regular player. Once you sign up with Party Poker, you can start playing in a large number of free roll tournaments and kick start your bankroll with the bonuses. As such, when you make an initial deposit of up to $500, you will get 100% deposit match bonus. In other words, you will have twice the money to play on poker tables and in tournaments once you have made the initial deposit. However, all bonuses and promotional offers offered by Party Poker, and any other online poker site for that matter, are subject to change at any time. Hence, we recommend all online poker players to first have a look at the online poker website and read the terms and conditions associated with the bonuses before starting. Texas Hold ‘em is the most popular variation of poker online and is definitely one of the best if you’re playing here at Party Poker. Omaha and Omaha Hi-Lo are also popular variations of poker with little difference in the playing structure. For instance, in Omaha there is only one pot prize, whereas in Omaha Hi-Lo there are two pot prizes available that you can win in every game, thus, doubling your chances of winning. 7 Card Stud and 7 Card Stud Hi-Lo are two more variations of poker that you will find as highly rewarding in Party Poker. There is little difference between these two variations other than the payment structure where you can win two pots in 7 Card Stud Hi-Lo, similar to what happens in Omaha Hi-Lo. Party Poker features an advanced network that allows you to conveniently play poker games at any time, round the clock. As a fully licensed and regulated online poker site, you can rest assure that all payment and deposit transactions are as responsive as possible. Here, we have covered some of the key features, benefits, and facts regarding playing on Party Poker. Party Poker is fully licensed and regulated by the Gibraltar Gambling Commission. In other words, you are guaranteed the ultimate online gambling experience on Party Poker where you can safely join and play on poker tables and in poker tournaments without having to worry about security or unfair gambling practices. Party Poker is definitely a leading online poker site when it comes to competitive poker tournaments. You can easily access and play in poker tournaments at any time of the day and night and turn your bankroll into an investment. Whether you like playing free rolls, satellites, or in main event poker tournaments, you sure have abundance in options when it comes to playing in poker tournaments with large pot prizes up for grabs, only on Party Poker. 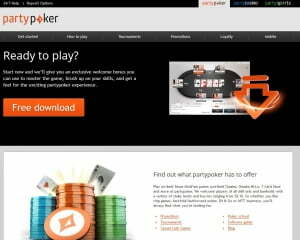 Party Poker has one of the largest customer bases of regular online poker players in the gambling industry. This makes it one of the most viable online poker houses to join and regularly play on. In other words, there is no time on the clock where you won’t find hundreds to thousands of online poker players competing against each other to take big prizes home. Party Poker gives you more than 50 different banking options, one of the largest of its kind in the online gambling industry. As such, you can easily deposit money, withdraw your earnings, and do it more quickly and efficiently on Party Poker. Party Poker is renowned across the world for offering the best value for money and a great testament to that is the Poker Player Rewards Club which you can join by simply becoming a regular poker player. It is similar to Casino Rewards Club featured in land based casinos where you can get more rewards, bonuses, and extra earnings from each win you make. Complete details of the Poker Player Rewards Club can be accessed on the Party Poker website. If you had to choose an online poker site solely based on the poker platform at offer, you will definitely choose Party Poker with your eyes closed. It features probably the most advanced poker software that can be downloaded on your desktop. Not just that, but the downloadable version allows you to enhance game play features and make use of additional rewards and bonuses! Party Poker has been around for a while which explains its large pool of poker players. What makes it interesting is that Party Poker gives you incentives on becoming a regular customer. Overall, Party Poker is great online poker site for anyone who loves the game of poker!